Federally Qualified Health Centers needing to build new facilities, renovate existing space, or purchase new equipment quickly discover that capital development is a complex endeavor. The capital development process requires careful planning and clear objectives, as it can take years from project conception to completion. Without proper planning, health centers can experience unexpected pitfalls, financial destabilization, or lack of interest to get the project off the ground. Capital projects become more manageable when a methodical process is followed. 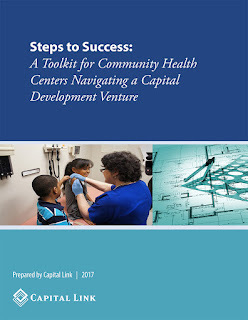 Capital Link’s newly released publication, Steps to Success: A Toolkit for Community Health Centers Navigating a Capital Development Venture, provides community health centers with a broad overview of the capital development process. This resource highlights eight fundamental planning activities that create a foundation for smoother completion, eliminating most of the guesswork, and allowing health centers to understand opportunities and risks. Each action step provides guidance and related resources to help successfully direct a health center capital project and keep it on track. Steps include: developing a strategic plan, analyzing financial strength, achieving operational and clinical excellence, defining market opportunity, developing a comprehensive business plan, creating strong leadership team with project planning expertise, identifying capital sources, and benchmarking objectives for continuous improvement. Help Us Report on the Capital Needs of Health Centers!